The futures appear headed to the 16.580 target shown. I posted this Hidden Pivot support in the chat room Thursday morning, but it was probably of little help to traders because of the downtrend’s rabid demeanor. I am not suggesting bottom-fishing with the usual penny-ante stop-loss, since the target closely coincides with some important lows from mid-January. Our main concern should be whether sellers take out both of those lows without a visually distinctive correction. 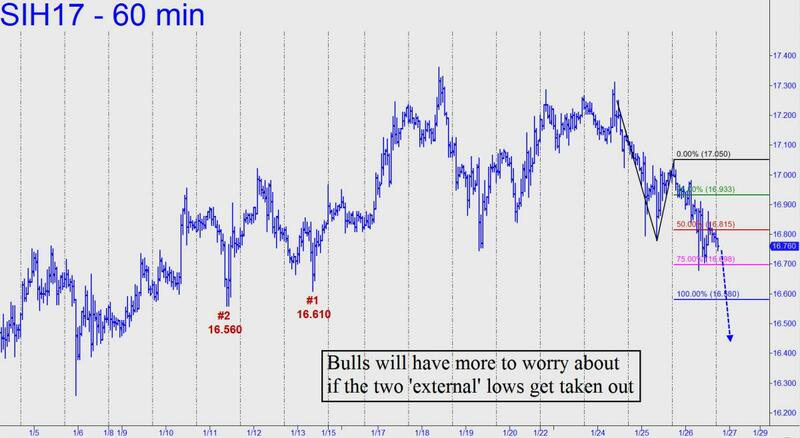 Were that to occur, I’d infer a test of support is imminent at 16.260, equal to an important low recorded on January 5. Alternatively, I’d need to see a pop on Friday above 17.075 to persuade me that buyers are serious.